I do not have children, but am at the age where all of my friends are starting to have babies so I know the importance of tummy time. 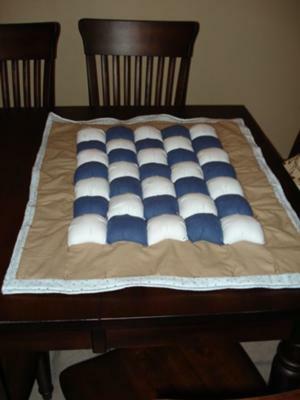 This quilt offers babies a more "3-D" tummy time experience due to the puffs in the middle. The basic directions are from a Family Circle magazine dated May 8, 1984 that my mom saved and then gave to me. She added the embroidery floss twist. 5/8 yd each of two coordinating fabrics. These will be the middle puffs. 1. Cutting: Cut 18 fabric #1 and 17 fabric #2 patches 6" square and 35 muslin patches 5" square. Cut four 5 1/2" borders from fabric #3, two 21" and two 39" long. Cut a quiltback from fabric #4 46" x 38". 2. Puffs: Pin each 6" patch of fabric to a muslin 5" patch, right sides out and corners matching. Fold the extra fabric into a tuck at the center of each edge. Topstitch around 4 sides, 1/2" from cut edge through all layers. Repeat for all 35 squares. 3. Quilt top: Seam 7 horizontal rows of 5 patches each, alternating fabric #1 and fabric #2. Seam on row beneath the other, alternating colors, creating a checkerboard. To each short end of the patchwork, seam a shorter border of fabric #3; to the longer sides, seam the longer borders of fabric #4. 4. Back to the puffs: Into the muslin back only of each patch, cut a short (less than one inch) slash. Stuff each square through the slash to raise the puff. Close the slash with a couple of stitches or a scrap of iron-on fabric. 5. Place the quilt top in the center of the quilt back wrong sides together. At each side 4” will extend for binding. Cut a piece of batting the size of the quilt and place in between the fabrics. Pin all layers together with large safety pins. 6. Beginning in the middle, take 3 threads of embroidery floss in needle. Push needle down through top of all layers and come up through very close by. Tie a square knot to bind quilt together. Do this at each of the puff corners and along the borders. Cut floss to desired length. 7. Top stitch along inner border edges. 8. Turn under ½” at short edges of the quilt back. Fold it over to the right side and pin turned-under edge to previous topstitching; edgestitch. Repeat for other two edges. Voila! You have a comfy quilt for baby to spend some tummy time! My little boy exclusively sleeps on this mat for his tummy time naps. I like that the "puffs" allow for room for him to breathe, and it also provides such a soft surface, while being sturdy and safe. Additionally, it looks really nice! We will be traveling with this as well, and know it will hold up. Washing has never been a problem and the integrity of the mat has never been compromised. Love it!